This attractive Grade II* listed church, with wooden louvres in the bell stage of the spire, is French Gothic in style. Part of the Archdiocese of Southwark, it stands just over the road from St Leonard's, the much older Parish Church, and was lucky to escape the fire that engulfed St Leonard's in 1975. It is especially known for its fine stained glass windows, all by the Hardman firm, and mostly dating from 1893. Photograph and text by Jacqueline Banerjee, 2010/11. 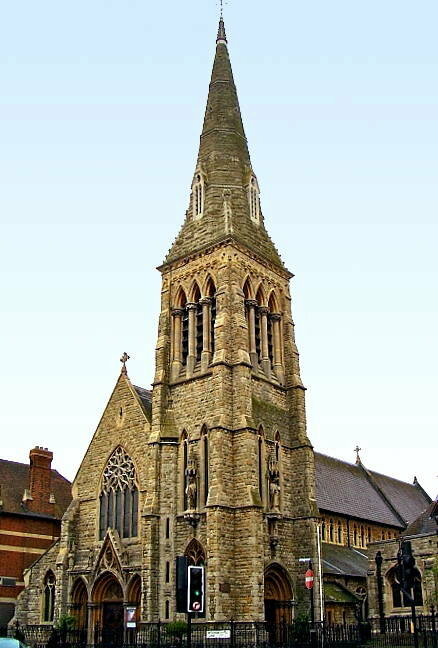 "British Listed Buildings: Roman Catholic Church of the English Martyrs, Streatham." Web. 7 March 2011. Cherry, Bridget, and Nikolaus Pevsner. London: South, Vol. 2. London: Penguin, 1983. Eberhard, Robert. Stained Glass Windows at Englsh Martyrs. Church Stained Glass Windows site. Web. 7 March 2011.